Current DC Bicycle Advisory Council member David Cranor made a Freedom of Information Act request to the District Department of Transportation (DDOT) in 2011. The purpose of the request was to view the findings of a report that surveyed bicycle parking at District government buildings. The report, which was prepared by Alta Planning and Design and the Washington Area Bicyclist Association, was the official response from DDOT regarding DC Council's request for a survey of bicycle parking at District facilities as a required in the Bicycle Commuter and Parking Expansion Act of 2007. 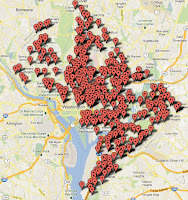 DCBAC has created a map based on the locations reported in Appendix E: Bicycle Parking Inventory. While the data is somewhat old and the District has made improvements to bicycle parking since this report, anecdotal evidence would suggest that parking is still insufficient. It also points to he problem of a lack of secure parking, highlighted in a recent cover story article by Amanda Abrams in Mid-City DC magazine. The Washcycle blog interprets the findings of this report by stating that only six percent of DC government buildings would meet current bike parking requirements. "While current zoning regulations require bike parking equal to 5% of automobile parking at commercial garages, no such requirement applies to office buildings owned and leased by the DC government", the Washcycle has determined. To create the level of parking needed to adequately satisfy current requirements would cost approximately $1.3 million (in 2010 dollars). The report focuses on bicycle parking but also contains the number automobile parking spots at government facilities. The map is based on a slightly modified table that eliminates locations with no parking (car or bike), removes duplicate addresses, and consolidates parking at co-located agency buildings (i.e. the Wilson Building contains several agencies but there is only on building). Class A spaces are higher security and are intended for longer term use, such as employee parking. The report recommends 2,802 new Class A spaces. Class B spaces are targeted to short term users and are located near building entrances to provide convenience for users. The report recommends 8,526 new Class B spaces. As always, we would appreciate your thoughts. Please feel free to leave a comment below.